POEM members are sure that Eden people will welcome the benefits for the community of proceeding with this project. 23 fulltime jobs Turnover $2.2 million p.a. This information is largely available on an annual basis over a 11 year period. POEM would welcome an independent review of the estimates. Real estate investment in Snug Cove: $100 million over 10 years (probably commencing with about $40m in stages on the BP site)-Bega Valley commercial builder. A major boost to the slipway and to other existing and potential Snug Cove and town businesses. plus the flow on benefits of becoming the maritime hub for south east Australia attracting many more visitors by sea and land. A two project solution? or A one project solution? No compulsion to vote. No names required. Based on professional advice, the POEM proposal for a 160m Berthing Pocket and Fixed Panel attenuator provides ample space for Cruise Ships and maximum all-weather protection for Snug Cove, delivering a safe anchorage, practical access and maximum marina capacity. 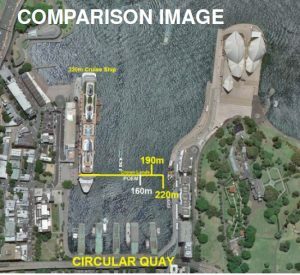 The Crown Lands proposal using a floating attenuator would not achieve a safe harbour, will significantly reduce marina potential and restrict access. 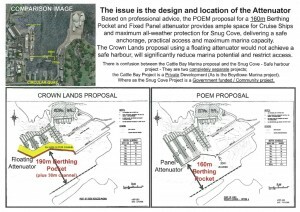 The Cattle Bay Project is a Private Development (as is the Boydtown Marina Project), whereas the Snug Cove Project is a Government funded / Community project. We would like to thank the many Eden people who gave our It’s Time for Eden community awareness campaign such a warm reception last weekend. We look forward to continuing the campaign in the weeks ahead. The main documents relied on by POEM are as follows. All are available on request. 1. Australian Cruise Association, Economic Impact Assessment of the Cruise Shipping Industry, AEC Group Ltd, Brisbane, Number of visits by port, various issues. 2. Infrastructure NSW, Restart-NSW, Investment Appraisal, Port of Eden Project-Wharf Infrastructure, October 2013. 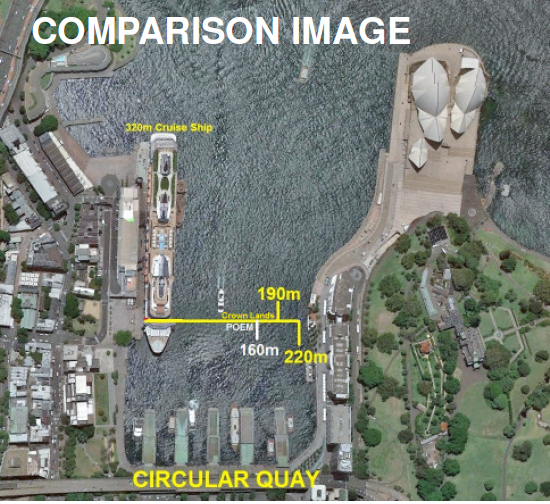 3. International Marina Consultants Pty Ltd, Port of Eden, Wave Protection and Marina Feasibility, July 2012. 5. Maritime Safety Management Systems, Review of Proposed Cruise Ship Arrangements in the Port of Eden, November 2015. 6. International Marina Consultants, Panel Breakwater Prop Wash Issues, December 2015. 7. International Marina Consultants, Marina and Cruise Ship Planning, November 2015. 8. Bellingham Marine Australia Ltd, Re: John Leman, International Marina Consultants, December 2015. 9. International Marina Consultants, Diagram of Port of Eden Reduced Marina – Option A, November 2015. 10. SMC Marine Pty Ltd, Glebe, NSW, Eden Marina Fixed Breakwall, December 2015. 11. Coriolos Marine, Eden Marina Project Report, June 2012. The professional qualifications and experience of International Marina Consultants and Marine Safety Management Systems are also available. As well as members with a great deal of local practical on water experience, POEM has a good depth of expertise in economics, engineering, business and science. POEM President, Fritz Drenkhahn said today. 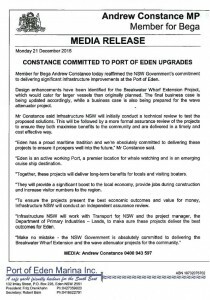 Member for Bega, Andrew Constance has said that a tender for a construction manager for both the Eden breakwater wharf and wave attenuator projects will close on 10 March 2016. It’s Time for the Eden community to be consulted and involved with the Snug Cove development projects. The Commonwealth and State Governments and the Council will spend at least $25 million to transform Snug Cove into a cruise ship port and a safe harbour with a marina basin over the next 2 years or so. This is literally a once in a lifetime opportunity for Eden for jobs growth and investment. The changes made to the port will be permanent, will determine the future of Snug Cove and will have significant implications for the Eden economy for decades ahead. If the projects are effectively combined, the outcome will be very positive for both the cruise ships and the safe harbour marina basin project. A combined project will provide the best, most continuous economic benefit with minimum long term risk for Eden and the south coast region. It will future proof the port. If this is not achieved and one or other project is seriously compromised, Eden will have lost a fantastic opportunity. It’s Time for the community to get moving and make sure Eden gets the outcome it needs. 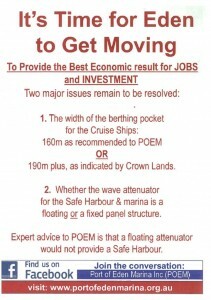 POEM welcomes renewed commitment by Minister Constance to funding both the Breakwater wharf and Safe Harbour/marina projects. The current planned location and design of the attenuator for the safe harbour/marina has been criticised by POEM consultant, International Marina Consultants as being risky and creating a non commercial marina layout. The Minister for Infrastructure and Transport and Member for Bega, Andrew Constance has ordered an independent review of the attenuator plans as quickly as possible so as not to delay the project which is due for completion by mid 2017.